The 'Main Battery' of VA-196 began life in July '48 as VF-153 but was redesignated VF-194 in Feb '50. They then became VA-196 in May '55, but were decommissioned in 1997. They flew the A-6E Intruder out of NAS Whidbey Island, WA. 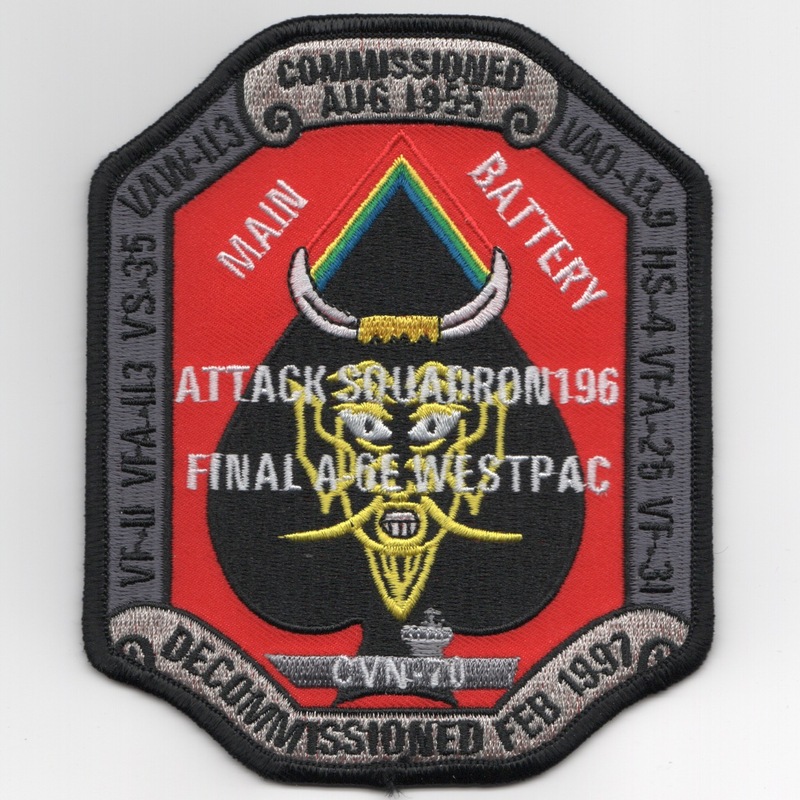 This is the 1997 'DECOMMISSION' patch created by them and does not come with velcro attached. The 'Main Battery' of VA-196 began life in July '48 as VF-153 but was redesignated VF-194 in Feb '50. They then became VA-196 in May '55, but were decommissioned in 1997. They flew the A-6E Intruder out of NAS Whidbey Island, WA. This is the "NK" version of their Mighty Intruder tailfin. This patch does not come with velcro attached. The 'Main Battery' of VA-196 began life in July '48 as VF-153 but was redesignated VF-194 in Feb '50. They then became VA-196 in May '55, but were decommissioned in 1997. They flew the A-6E Intruder out of NAS Whidbey Island, WA. Another AV8RSTUFF Creation: The 'Main Battery' of VA-196 began life in July '48 as VF-153 but was redesignated VF-194 in Feb '50. They then became VA-196 in May '55, but were decommissioned in 1997. They flew the A-6E Intruder out of NAS Whidbey Island, WA from 1966 - 1997. 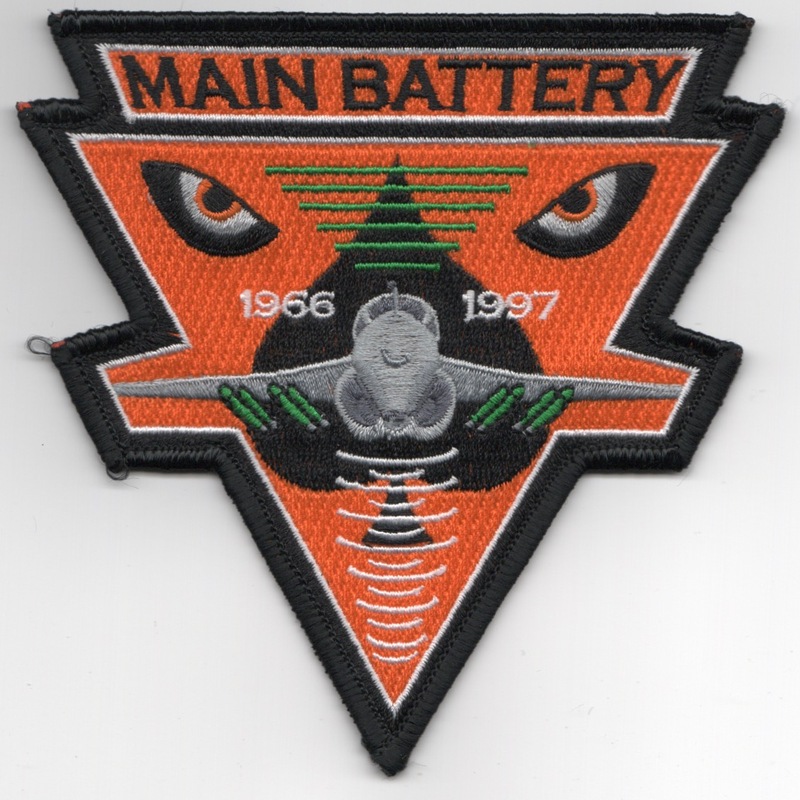 This is their Intruder patch that states 'MAIN BATTERY', depicts their years of flying the venerable Intruder, and does not come with velcro attached. The 'Main Battery' of VA-196 began life in July '48 as VF-153 but was redesignated VF-194 in Feb '50. They then became VA-196 in May '55, but were decommissioned in 1997. They flew the A-6E Intruder out of NAS Whidbey Island, WA. This is their Intruder patch that states 'Flight of the Milestones'. This is the small metal "cloissennette" that is worn on the nametag of the VA-196 personnel when they were in uniform. Many use them for award decorations as well. 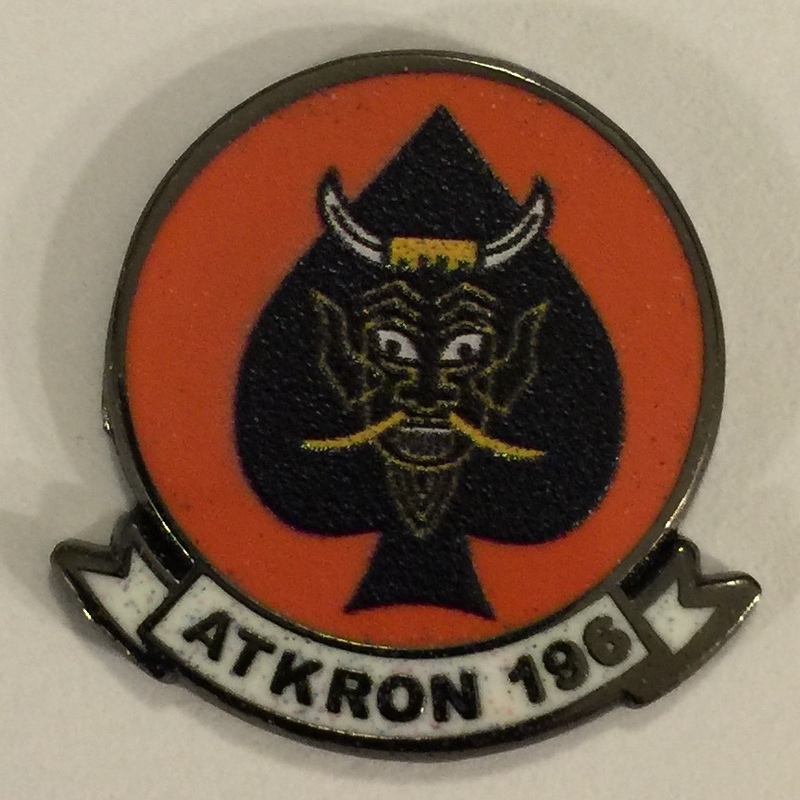 This is the small metal "lapel pin" with the squadron logo. It has a "rubber" clutch on the backside (they hold better). 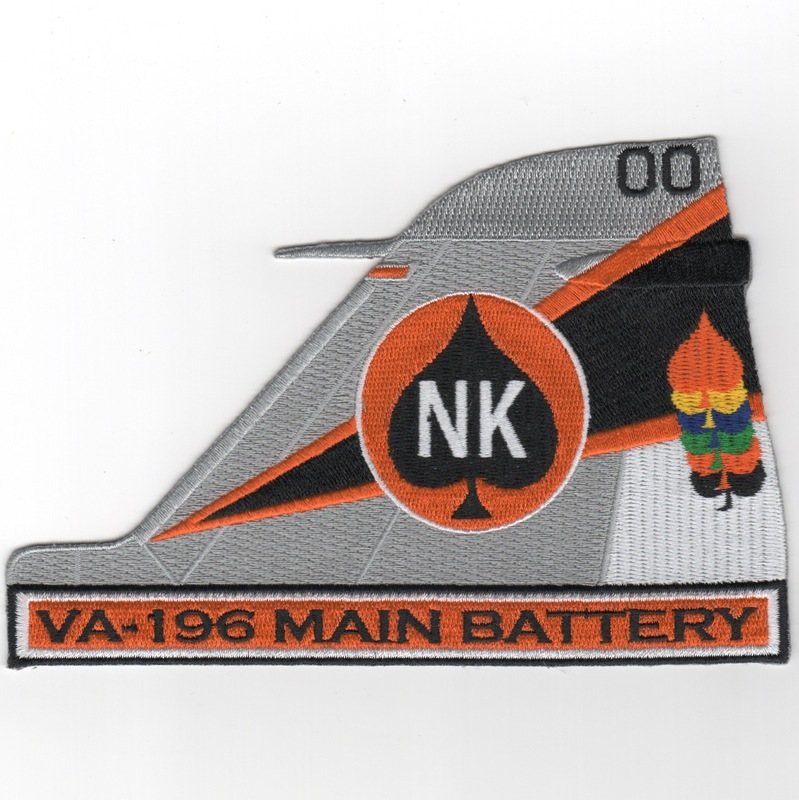 Homepage | Order VA-196 Patches!